In 1-quart saucepan, heat cream to a boil over medium heat. Place chopped white chocolate in heatproof bowl. Pour cream over chocolate. Let stand 10 minutes to soften chocolate. Beat white chocolate mixture with whisk until smooth. Refrigerate 1 hour. Heat oven to 425°F. Unroll both pie crusts onto work surface. Cut 8 rounds using 3 1/2-inch cookie cutter or cut around tart pan with sharp knife. Fit each pastry round into ungreased 3-inch tart pan. Trim edges with knife. Pierce pastry with fork. Bake 10 to 12 minutes or until golden brown. Cool in pans. Remove from pans; set aside. With electric mixer, beat white chocolate mixture on medium-high speed until whipped. Add peppermint extract; beat until combined. In another 1-quart saucepan, heat chocolate chips and butter over low heat, stirring occasionally, until melted. Cover bottom of each tart shell with melted chocolate. Top with white chocolate mixture. 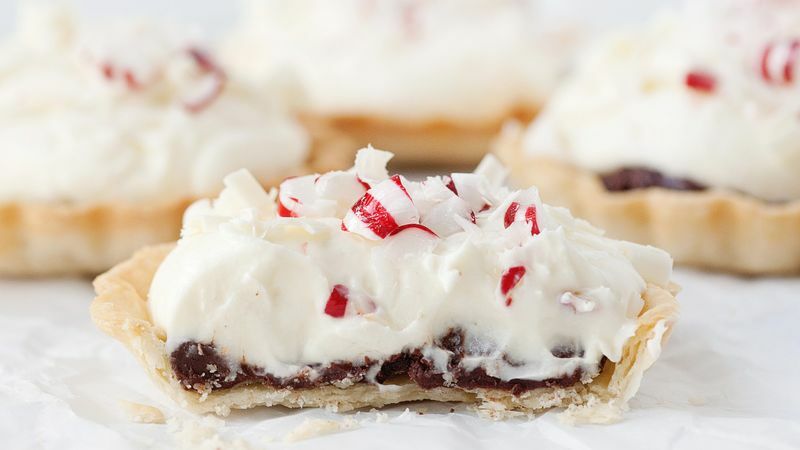 Garnish each tart with crushed peppermint candies and white chocolate curls. Refrigerate until ready to serve. If you do not have mini tart pans, you can use muffins cups or custard cups instead. These can be made at least one day in advance.